Join local artists and Cultural Arts Division staff for a Sneak Peak Tour of TEMPO Convergence! Public Art Inspiration + Inside Scoop. TEMPO is a temporary public art exhibition by local artists. Now in its sixth year, the TEMPO program features outdoor artworks by local artists sited across Austin in a temporary display. 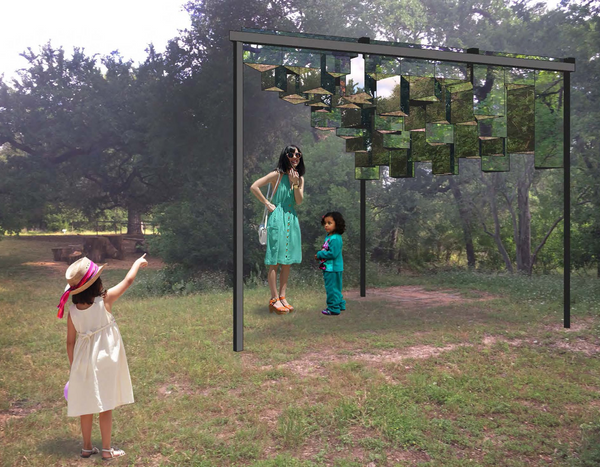 After weeks of being displayed in Austin parks and other City-owned sites, the works will be presented together at Edward Rendon Sr. Park in a collective outdoor exhibition called TEMPO Convergence as part of the East Austin Studio Tour. We would love to [open the doors] ahead of time to the ADW community! Join us for a walking tour of TEMPO Convergence to see the art works and learn from Artists and Cultural Arts Division Staff exactly what it takes to create, fabricate, and install a work of public art for the City. TEMPO works tend to be joyful, playful, and thought provoking pieces that use a variety of techniques and materials. A few of the pieces that will be in TEMPO 2018 include: mirrored clouds, 4' high tennis balls in the shape of a constellation, a completely open 1:1 wire frame sculpture of a typical 1950s home painted bright yellow, and a literal open door reflecting upon the connection between natural and urban environments that visitors can walk through. These pieces help open doors to public art and encourage civic dialogue between citizens, the city, and visitors to Austin on topics ranging from housing affordability to community resilience to futuristic imaginings and national identity. The Cultural Arts Division, part of the Economic Development Department, manages the City’s cultural arts programs and provides leadership for the economic development of Austin's creative economy. The Division oversees the Cultural Arts Funding Programs, Art in Public Places Program (AIPP), programs to assist the development of creative industries in Austin, and initiatives designed to support the community’s unique cultural identity and vitality. Image courtesy of TwoPlus Collaborative, "Mirror Cloud"